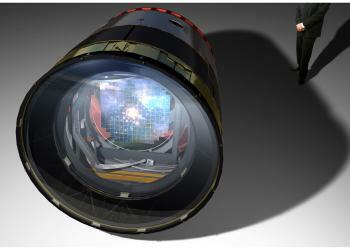 The proposed 3.2 billion pixel Large Synoptic Survey Telescope (LSST) camera has been okayed by the US Department of Energy to proceed to its next stage of development. Receiving “Critical Decision 1” approval from the DoE means the project will get busy with the serious business of engineering design, scheduling, and budgeting. The DoE is funding the design, with the final instrument to be jointly funded by the DoE and the National Science Foundation. When operational, the SLAC National Accelerator Laboratory-designed skywatcher will survey – and publish – the entire visible sky on a weekly basis, producing around 6 million gigabytes a year. To do this, LSST project manager at SLAC Nadine Kurita says the instrument will have “189 sensors and over 3 tons of components that have to be packed into and extremely tight space”. Work has begun on the telescope’s Chilean site, as well as its 8.4 meter primary mirror. The scientists hope to put the instrument into service in 2014.